Researchers have coaxed RNA to self-assemble into 3-D arrays, a potential backbone for nanotech scaffolds. These RNA structures can form a wider variety of shapes than double-stranded DNA can and are easier to manipulate than many protein alternatives. Peixuan Guo of Purdue University and his colleagues report the findings in the August 11, 2004, issue of the journal Nano Letters. RNA (ribonucleic acid) molecules are best known for implementing the genetic information encoded in DNA (deoxyribonucleic acid). However, instead of using the long molecular strings to carry information, the researchers have achieved new control over RNA and created novel arrays. By mixing the custom-made RNA strands with other substances, such as magnesium chloride, the researchers were able to get the strands to join into 3-D shapes. In 1987, Guo discovered that a bacteria-infecting virus possesses a biomolecular nanomotor that requires RNA molecules to function. 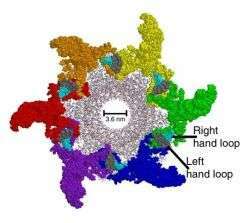 While determining how RNA works in that motor, he learned to manipulate and control RNA assembly. Now, Guo and his colleagues have applied that knowledge to building artificial RNA nanostructures, including “large” 3-D arrays formed from identical RNA building blocks. 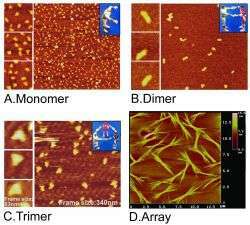 Because these arrays extend to several micrometers, far larger than individual RNA strands, they may potentially link nanofabrication with current microfabrication processes. The researchers hope that the arrays, while still in the earliest stages of development, will one day serve as the scaffolding on which diagnostic chips, tiny sensors, gene delivery vehicles and other nanoscale devices will be mounted or constructed. (a), sets of two strands that form rod shapes (B), sets of three strands that form triangle shapes (C) and multi-strand arrays forming bundles (D). The figures in the insets help illustrate how the RNA molecules in each shape are bonded to each other. “The discovery of this viral RNA machine is quite remarkable and provides yet another example of the flexibility and versatility of RNA. Dr. Guo is exploiting the properties of RNA in a new and potentially important way.” – Patrick Dennis, Program Director for Microbial Genetics at the National Science Foundation and the officer who oversees Dr. Guo’s award.